The upper canyon and the trail I was following was covered in snow, as were all of the mountainsides around me. My attempts to follow any trail that might have been there were thwarted by an early season snow storm and lack of a thaw. I was pretty sure that I could have figured out where the gap in the mountains was where I was suppose to cross over to the other side but I had never been there before and didn’t know what the snowpack was going to be like on the other side. Pausing, I caught my breath and listened to the sounds of water trickling everywhere from snow-melt, and realized that my feet were soaked from hiking in trails that had become streams. I thought this was going to be my last trip of Fall and I was not prepared for winter, not yet anyway. Farther down the canyon, I had hiked through an autumnal world of slanted light colored by leaves releasing colors previously hidden by the photosynthetic rapture of summer. Yellow willows, red dogwoods and golden elderberries reminded me of the splendor of fall foliage in upstate New York where I had grown up. While nowhere near that colorful, I delighted in the splashes of deciduous color in an otherwise monochromatically green conifer world. Unable to find the gap I was looking for which would have taken me over into the next drainage, I turned around and headed back down following the footsteps that I had just made in the ankle to shin deep snow. The upper canyon, in this part, was dotted here and there with montane conifers like western white pine and mountain hemlock, old friends of mine whom I was glad to see. We always see to meet in such beautiful places. Red rock boulders sat like giants on their haunches amidst an otherwise granitic mountain world.In addition to the red rocks and green conifers, willows stuck out through the snow, the yellow hue of autumn emerging through the sparkling white of winter. They seemed as surprised by the snowfall as I was. I thought I would just keep descending back into the canyon in order to find snow-free camping and firewood by which to stay warm. That would have been the prudent thing to do but I also knew that a lake lay off-trail to the south. Without giving it much thought at all, my body simply turned up the chute that lead to the lake and I started climbing. It quickly became apparent that this was going to be a slog through soft snow that was shin to knee deep if not deeper and that it was not going to be easy. The pull of wonder – where was I going and what would I find there- kept me going and onward I trudged, stopping every now and again to pant, sweating all the while in the cold mountain air. What is wonder, what is the feeling of wonder and where does it come from? After an hour of hard climbing through deep snow, I crested the top of the pass and was greeted by a cold wind and an icy and breath-taking world. While I was not thinking then about wonder, I was blown clean and cool by the wind and the wonder of it all. 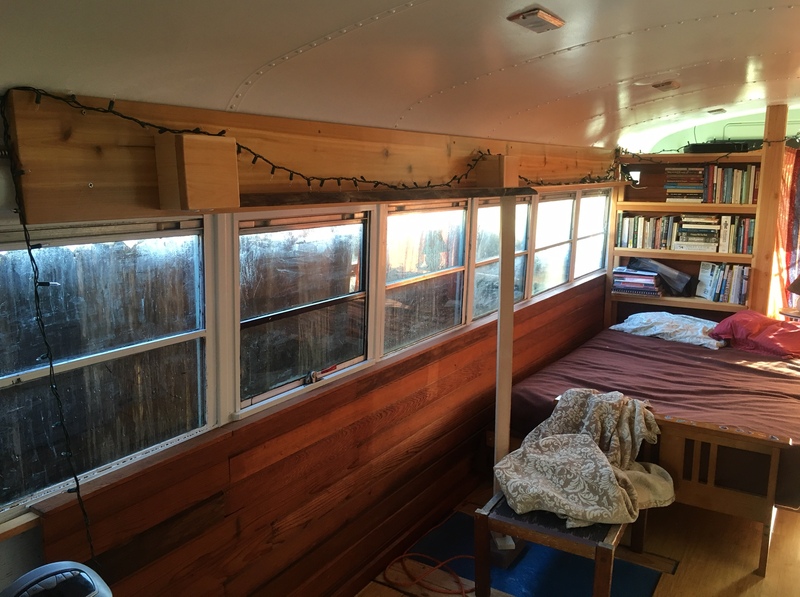 As I now consider wonder and wonderment from my cozy house, I realize just how much it was a part of this trip for me and how ordinary it really is. The climb to this lake was not a conscious decision; really it just happened. And once I was there I just set about clearing snow away so that I could set up my tent. I simply flowed and wandered in the mountains, finding myself on a snow-covered pass with a dark and brooding lake some seventy-five feet below me. I have often thought of wonder as being close to ecstasy but realized on this trip that it could also be very simple and plain. Most ordinary. I went about clearing snow, setting up my tent and laying out my sleeping bag because those were the things that needed to happen. While I did not stare about me in amazement, I was full of wonder at where I was and how I had even arrived here. Wandering and wondering go hand in hand and it’s impossible to tell where one ends and the other begins. It’s best to remember that not all who wander are lost – they could simply be on the edge of wonder. As I lay down in my down sleeping bag, feeling returning to my frozen toes, I simply breathed deep and stared in wonder at my tent fly. I was full of gratitude for being so very much alive in such an wondrous place. Why the crazy doors? 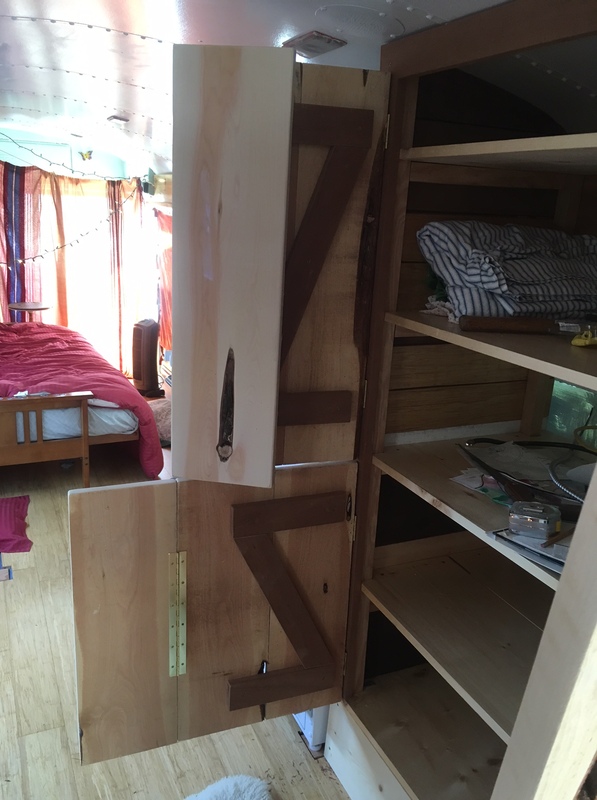 Well, the juniper wood is pretty heavy, so I didn’t want to have a massively heavy door – when I thought about a Dutch door it also occurred to me how much the girls would love to have a little door just their size to play house with. They are both thrilled. 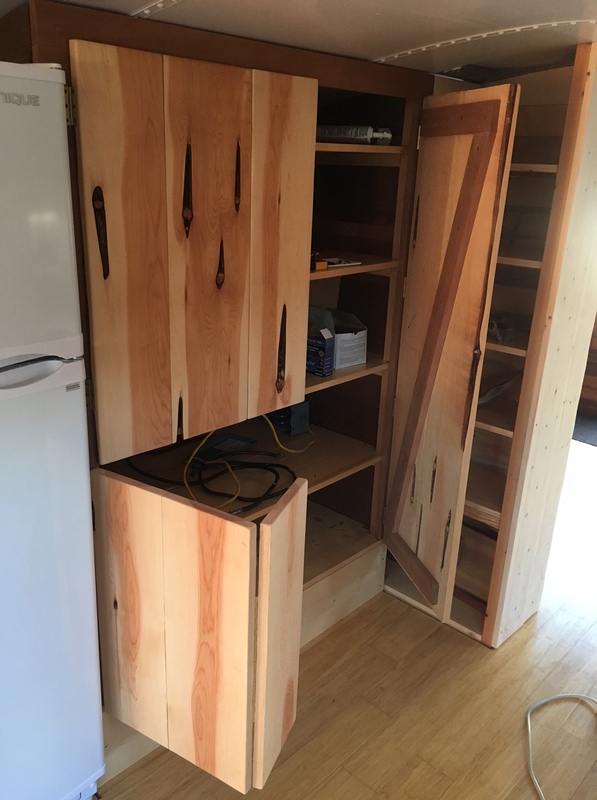 And the hinged section is just so that the door takes up less space when you swing it open, since it’s in a tiny kitchen and it’s going to be very tight quarters as it is! The final touch: driftwood handles! I stopped wiring a while ago when I was halfway done because I ran out of wire. Silly, isn’t it? I finally bought more and now the wiring is almost done. 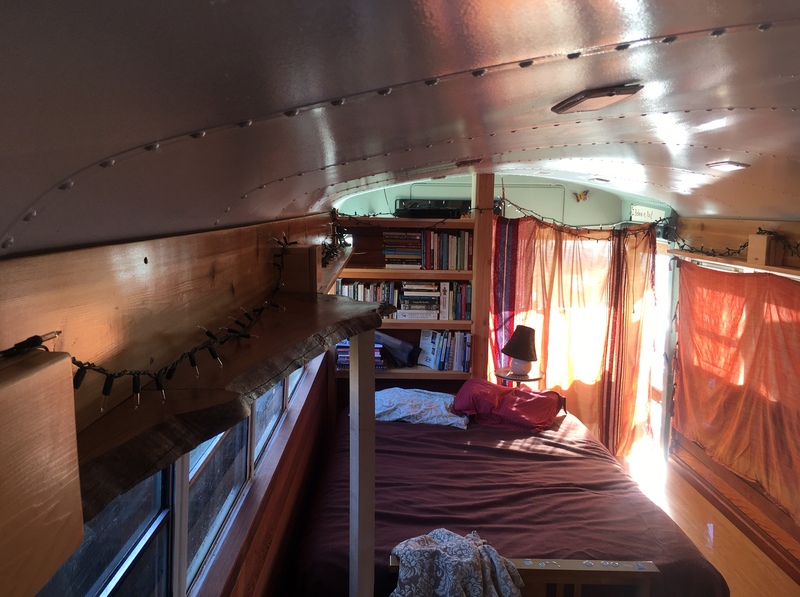 To complete the wiring I also had to get the wood shelf and outlet boxes up on the wall above the windows (which hides the wires), and this took me a little while. 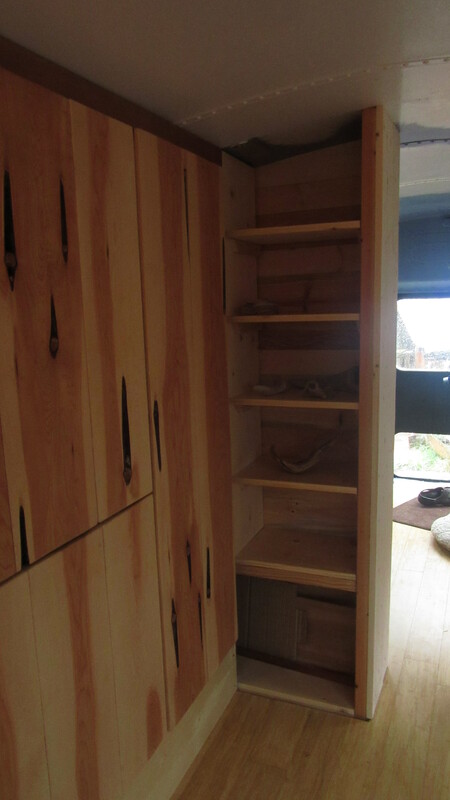 The big chunk of black oak that you can see sticking out further than the other shelf will be a kitchen shelf, and will sit above a deep counter. Right now it’s a major safety hazard, as you could just walk face-first into it, so it’s blocked by a table at present. 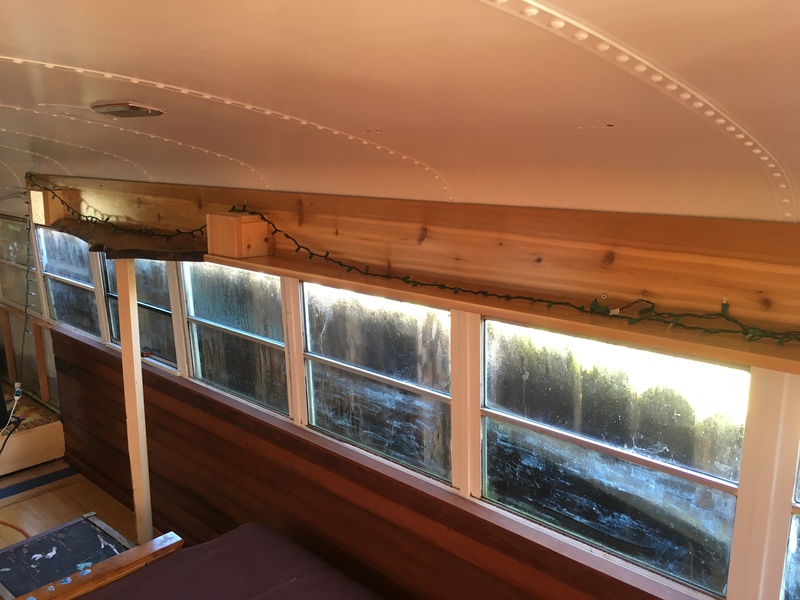 The girls room is almost totally separated from the rest of the bus – just needs a door! Woo hoo! 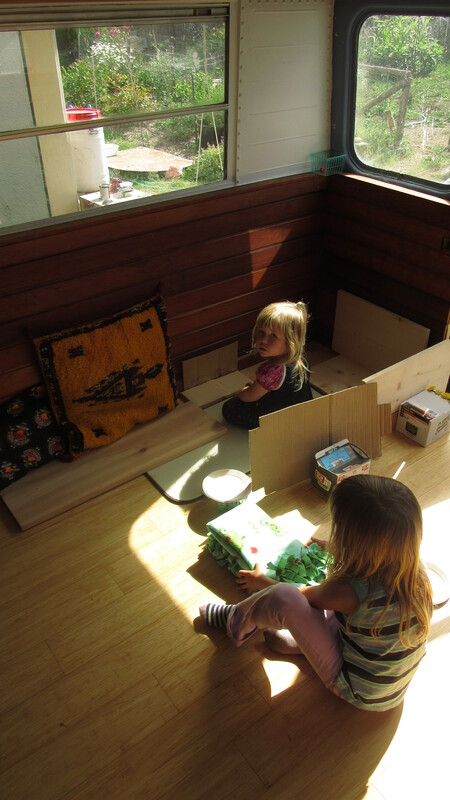 And just because no post is complete without the girls, here they are using bits and pieces of wood and boxes of screws, etc, to make their own tiny playhouse. Drifting onward to another time and place. Or the clouds move the wind? We love you clouds and birds and trees. Ah, now I feel it! Dark red giants stand still.